They are somewhat revolting. They dine on dead animals, even skunks. They look a bit creepy with their wrinkled, almost bald heads. We see them just about every day as we drive the Texas roads. Sometimes, they wait until the last moment to hop up or take flight to get out of the way — not always successfully. 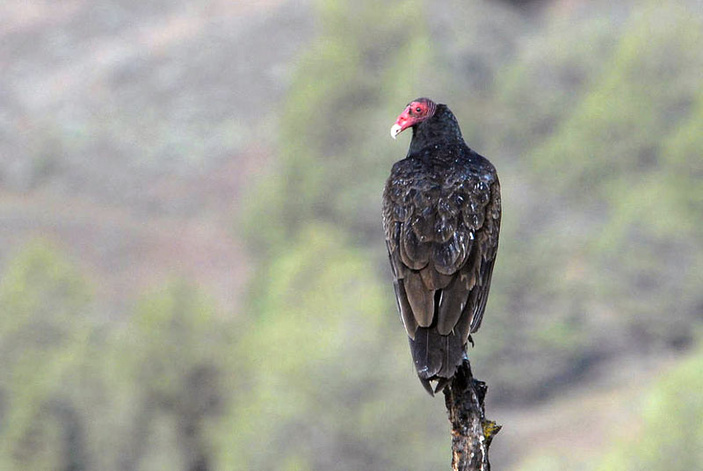 When it comes to birds, turkey vultures and black vultures don’t get near the attention other feathered creatures do. Even the barnyard rooster seems more loved. But Master Naturalist Martelle Luedecke wants to change our view of these incredible and important birds. Luedecke presents “Vultures — Nature’s Cleanup Crew” from 9 a.m.-noon Saturday, April 13, at Numinous Coffee Roasters, 715 RR 1431 in Marble Falls. It’s come-and-go event, so you don’t have to worry about getting there at a precise time. Just show up during those three hours to learn about these birds. The presentation is part of the Upper Highland Lakes Natures Center’s A Taste of Nature series, which features different topics twice a month at the coffee shop. There are quite a few things you might not know about vultures. They are members of the New World Vultures group found in the Western Hemisphere, which also includes the California condor. Old World Vultures are species found in the Eastern Hemisphere such as Africa and Europe. • They don’t have sweat glands, so how to they keep cool? • They are bald, but do you know why? • A group of vultures feeding on roadkill is called a “wake.” But do they only eat dead things? • And what’s with their stomachs that they can, well, stomach eating dead things? Stop by Numinous on Saturday and get the answers to these questions and more.